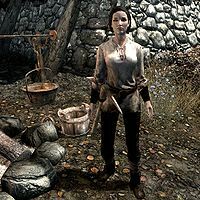 Sylgja is a Nord miner of Shor's Stone. Her parents are Verner Rock-Chucker and Annekke Crag-Jumper in Darkwater Crossing. She has been unable to visit them due to a leg injury and only recovered at all thanks to a passing priest of Mara. Sylgja starts off her day by waking up at 5am and resting for an hour in her house. At 6am, she proceeds to Redbelly Mine, where she works for most of the day. She will be mining for twelve hours until 6pm, when she finally stops work and heads home. She will relax in her house for an hour until 7pm, and then spends four hours around the campfire at Shor's Stone. She will be either cooking or simply sitting by the campfire until 11pm, when she heads back home to sleep. She sleeps for six hours and repeats her schedule the following day. Like most miners, she wears a set of miner's clothes and a pair of boots. She is equipped with a pickaxe and carries the key to her house, as well as a selection of common items and gold. She seems to be quite proud of her job working in the mine, and if you ask her about the mine itself, she will somewhat sidestep the question and remark, "I might be a woman, but I can crack rock with the best of them." before relaxing and telling you, "Be careful in there, you can take a nasty spill." You may also ask about her accident and she will tell you, "I had a bad fall in the mine when I was bringing some food to the men. I was pretty bad off for a while, but a priest of Mara was passing through on his way to Dawnstar and healed me to the best of his abilities." Despite his best efforts, however, she remarks, "I'm still pretty sore and can't really walk too far without having to rest for a while." She soon asks you, "Would you happen to be headed towards Darkwater Crossing?" If you ask why, she tells you, "My parents live there. I usually make the journey to bring them gifts and to just say hello, but I haven't been well lately." before explaining further: "I've written some letters and placed them in a satchel. Perhaps you wouldn't mind delivering it to them on my behalf?" Once you agree to deliver the satchel, she will be relieved and remark, "You would? Well then, I would insist on rewarding you for your time. Here, take my satchel and give it to my father, Verner. He'll likely have something for you to bring back." Before setting you off on your journey, she will give you some advice: "Darkwater Crossing is a difficult journey. Mind yourself." As soon as you arrive back from Darkwater Crossing, Sylgja is delighted and rewards your efforts before saying, "Ah, yes... seems he sent back my satchel stuffed with letters. I look forward to reading them. I appreciate the delivery, here... I want you to have this. I insist." Sylgja: "I owe it all to my father who started me swinging the pickaxe when I was a barefoot little girl." Sylgja: "Thank you. It's nice to know someone admires me for more than just my appearance." She can be married after you have done her a favor by delivering a satchel to her father. If you choose to move in with Sylgja, you will have full access to her house and items and she will carry on with her regular schedule. Special Delivery: Make a delivery for Sylgja to Darkwater Crossing. The chest at the foot of her bed is not safe storage for her spouse. Sylgja mentions that a "priest of Mara on his way to Dawnstar" was the one who healed her. This is almost certainly Erandur. Despite them being close family, there is no special dialogue when you visit her with her mother as a follower. After you do Filnjar's quest to clear Redbelly Mine of spiders, the spiders may respawn, and if Sylgja is inside she could potentially be killed. Prevent this by only revisiting the mines when the workers aren't there (at night). The townsfolk mistakenly refer to Sylgja as "Grelka". Sylgja may completely vanish without warning. This can be solved by breaking into her house. After completing her quest, you may not be able to marry her—instead, she will only talk about the mine. Select her in the console and type addtofaction 19809 1 to ensure she is a member of the necessary faction, then try again. Sylgja is not linked to her bed which prevents you from picking up proper ownership of the marital bed.